Anyone who knows me will tell you I’m a nice person, always have been. But as a girl growing up in the 1970s, the insides of this nice girl churned with anger. I was very conscious of the limitations society put on me as a girl, as I was also conscious of the struggle for gender equality raging around me. 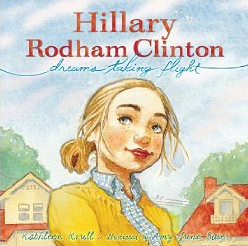 Tonight, after my boys read Kathleen Krull’s inspiring picture book biography HILLARY RODHAM CLINTON: DREAMS TAKING FLIGHT, they engaged me in a conversation about gender equality. I told them how hurt and angry I was about the way I perceived girls being treated then. I told them about the way my dad—a father to four daughters—always told me I could do anything I wanted to do no matter what. I told them about how my mom showed me what a strong woman looked like by paving her way in the intensely patriarchal financial sector, eventually reaching vice president level. And I told them about Steve. “Steve” was the persona I had to take on in order to play adventure games with the neighborhood boys. As “Deborah” my role in those games would have been to sit in the tree awaiting rescue. Unacceptable to me. Thus, Steve was born. 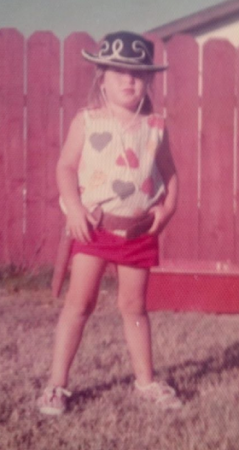 Sometimes I wonder why I didn’t have the bravery to stand up to those boys, feet firmly planted on the ground, and declare that “Deborah” would be an adventurer, too. Other times, I’m quite proud of my little elementary-school self for finding a way around their prejudice instead of simply not playing and thus being left out. Either way, it’s something I think about often. That experience influences me as I raise my sons, in my conscious commitment to growing men who are enlightened and blind to gender when it comes to accomplishments and opportunities. I never once sat in that damn tree. It’s funny—I’ve told the general story to people a number of times over the years, but never revealed the detail about the Steve persona. Don’t know exactly why I kept that to myself all this time. It was never really a conscious decision. Ah, the psyche…. Had a lovely example to follow.